Just weeks before Kristalina Georgieva was named interim President of the World Bank. ISC’s Board Chair Jonathan Lash sat down to interview her for the first episode of his new podcast What’s Possible (produced in partnership with ISC). What’s Possible is an exploration of the work that people are doing all over the world to tackle climate change that Lash and ISC will release every other month. 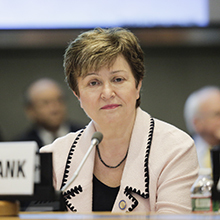 Throughout her career, Georgieva has focused on designing and financing sustainability, resilience, and humanitarian efforts throughout the world. She also served on the ISC board of directors from 2001 to 2005. In this episode of What’s Possible, She shared some locally-led promising projects and initiatives being funded by the World Bank with the goal of mitigating emissions and adapting to a changing climate. Listen below or subscribe to the Sustainable Communities Podcast Network here!